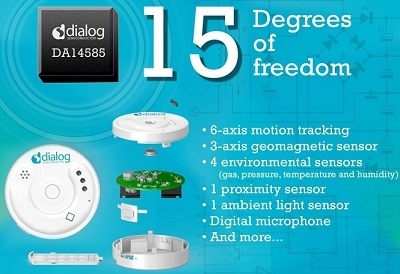 Dialog Semiconductor has released a new 15 Degrees-of-Freedom (DOF) SmartBond Multi-Sensor Kit to support sensor connectivity in the Internet of Things (IoT). Built on Dialog’s DA14585 SmartBond System-on-Chip (SoC), the kit allows engineers to easily connect sensors to the cloud at the lowest power and smallest footprint. Dialog’s SmartBond Multi-Sensor Kit represents best-in-class performance, longevity and range. Based on the SmartBond DA14585 SoC and powered by 2 AA batteries, the kit delivers long lasting battery life and a range of up to 300 meters. Sensor data collected by the onboard, integrated DA14585 can be processed locally by Dialog’s unique SmartFusion software to enable data transmission with minimal interference and the lowest power consumption prior to transmission to a smartphone or Bluetooth low energy-enabled Raspberry Pi gateway to the cloud. The Multi-Sensor Kit is supported by Dialog’s software suite, which includes application software running on the DA14585, cloud gateway software for Raspberry Pi hardware, web applications and mobile applications for Android and iOS.